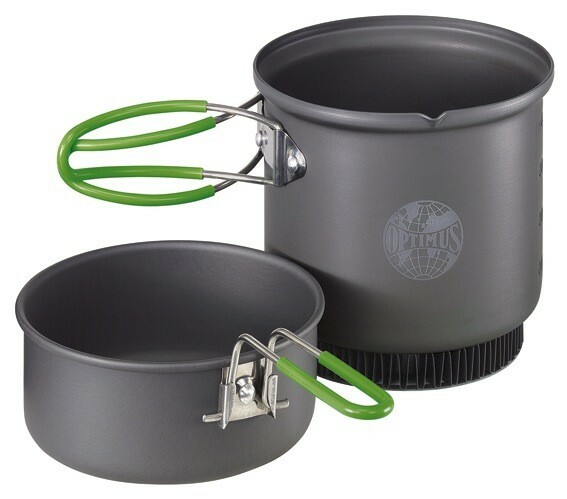 TECHNICAL *Includes Pot and Lid/Frypan *Pot Volume: 0.95L *Weight: 275g DESCRIPTION Highly versatile and efficient 2-piece hard anodized aluminum cook set. The special heat exchanger on the bottom is very unique and reduces time to boil by 20% and channels the flame to the bottom of the pan but not allowing heat to escape sideways, making your stove energy efficient and saving fuel when cooking. Set includes: 0.95 L Heat Exchange saucepan with pouring lip and measuring marks (mL and oz), fry pan that doubles as a lid, and mesh storage bag.